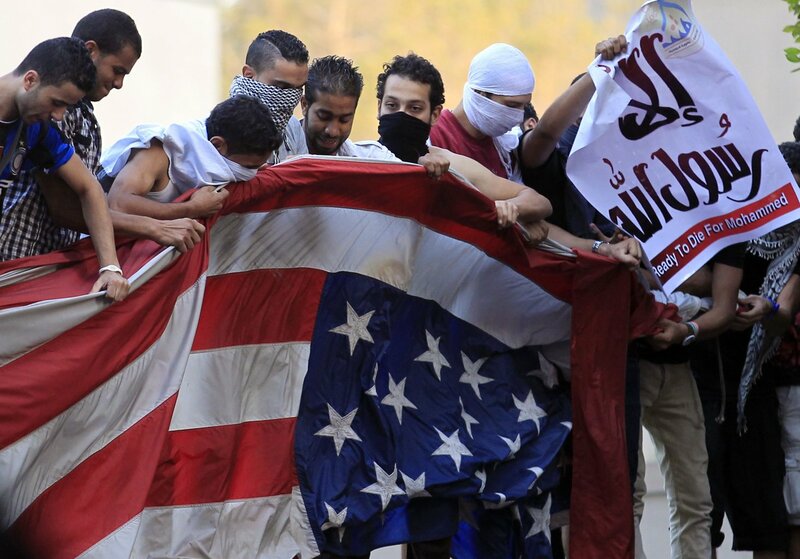 Today on Sept. 11th, 2012, Muslims in Egypt scaled the US embassy walls in Cairo, captured the American flag, tore it to bits, and burned it outside the embassy walls. Apparently, they are made because America is making a film that insults the prophet Mohammed. The name of the film isn’t given, nor is the American film company. I wonder if these Muslims actually think that the American government is making the movie? Check out the guy’s sign on the far right of the above image. It says on the bottom, “Ready to Die for Mohammed!” Why would he be ready to die for Mohammed? Shouldn’t he be ready to die for Allah? As America remembers Sept. 11th, 2001 in our way, the Muslims overseas remember it in their way!! !